Good to start out the week with an award. 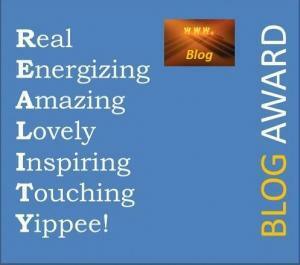 Thank you Elizabeth Rose for nominating my blog for the Reality Blog Award. Please visit her site elizabethrosemysteries.com. I came to know her and her blog because she’s the author of a book that has a setting in my hometown, Murder in Death’s Door County. 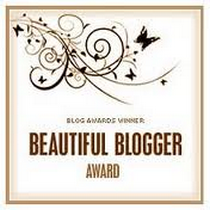 Those who are lucky enough to receive this award are asked to post the picture of the award on their blog and link back to the person who nominated them. Wow, what a difficult and vague question. About the world? Myself? I’d like every person in the world to at least explore the possibility that Jesus Christ could be the one true God who will bring peace and grace into their life, as well as the gift of salvation and everlasting life. 3.What is one thing that really scares you? That because of my own devices, I miss doing things in my life that I was meant to do. 4.What is one dream you have not completed, and do you think you will be able to complete it? I’d like to see the novels I’ve written get published. Do I think it will happen? Yes. Two of my novels are with my agent and am hoping to hear some good news soon. 5.If you could meet any TV or movie star who is still alive, who would it be? Denzel Washington. I think he’s a really good guy. Holly, I enjoyed this post immensly! It has been a really hectic Monday morning and I almost didn’t take time to read it, but I am so glad I did. Applause! Applause! Thanks Bette, have a great rest of the week! Congrats, Holly. Woo-hoo, how fun. Thanks Silvia! Hope you are well! Congrats, Holly! And I love your answers!!! 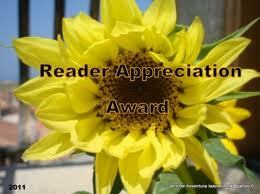 Good luck with the novels–I hope they get published ‘cuz I’d love to read them! Congratulations on your award Holly. Well deserved. Good luck with your books. 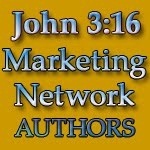 You will get published!! Thanks Darlene, hoping and praying! God bless you!